- You must submit your entry in this topic! - You must build a house using parcels only. 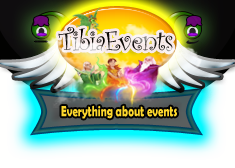 - Enter a short description telling us why your house should be chosen by Eventholder. - Enter a final screenshot of the whole house and at least 3 screenshots of the process. - Please, do NOT edit the screenshot! - Submissions must be in English only. - We will judge your house, your decoration and mainly your creativity. - The content must NOT be related to inappropriate things or have inappropriate language. - Plagiarism leads to disqualification. - Please inform us the name of your character and the world (You won't be disqualified if you don't, but please do!). The contest starts Apr 2 2019 - and ends on Apr 23 2019 23:59 Cest. 1st Place: Golden prison key + memory box. 2nd Place: Silver prison key + choice between 10 x bullseye, 10 x mastermind, 10x berserk potion. 3rd Place: Bronze prision key + choice between 10 x bullseye, 10 x mastermind,10 x berserk potion. I try to made something good but another homeless stolen my rent-free house. If u want, he can share the house if u bring some bread!! My house is simple but made with a lot of love! I have created this beautiful house with sea view for you, you will love living here because you can hunt crabs and ride horses near the coast, you can also collect coral shells and playon the sand! I think Eventholder will be so happy in the Meriana Island because it's a very peace place, living near the ocean, taking careful of his Parrot, Seagull and Flamingo, polishing some beautiful armor/helmet/swords. He can admire the ocean through the Telescope, catch any type fishes and warmself in a white-blue bed. And finally, receive his visits at your large dining table, he will be able to walk around the island and meet the Laguna Islands taking a short travel with a Big Sea Turtle in northwest from this house! After visiting the most exotic places of tibia, I decided to build my house in a majestic place full of contrasts never before seen. My house consists of 2 parts. 1) On the right we can see a table with a good muffin and a cup of black coffee (nothing better to be in a comforting home) and a good book to read (walking around the town of the dwarves I became friends with Lardoc Bashsmite he lent me that book, he told me that if I wanted to be of help for the dwarves I should know more about their history). 2) On the left there is a beautiful bridge where a waterfall passes, an old birch trunk adorns my steps to reach my room. It is a very humble room. I have my bag where my armor, my clothes and my food are. Also, I take a little time to paint, as you can see, how can you not feel inspired when you are surrounded by flowers and nature? hello I present my house I cost work to do since we are in war and it is difficult to take the items to that location but I managed to inspire me in the house because I like the sea and animals and I love having a house in the game. Well, I believe that Mr. Eventholder should choose my house, because although simple there is nothing more beautiful than the light of a frozen starlight illuminating the skies of a desert surrounded by the sea, accompanied by a good literature to relax. Hello I hope I can still participate in the contest my picture number 1 got deleted while trying to resize it. So I've been living in the depot my whole life, I was saving some money to get a house but since the prices went up I didn't give up in getting a house that I decide to make with my own hands. This house is called "The parrot hall" is a 1 room house with a chimney included for those cold winters, a very comfortable kitchen and a hall that could also be used as living room. In the outside you can see a very small lake where not only you could get water for your home but also could be used as a Jacuzzi. The Jacuzzi has a little garden for a best experience, the flowers give you that delicious smell to lavender that relaxes your body. Here I'm trying to get a good photo shoot with my friend parrot. I built this house especially for the Eventholder, here it will live comfortably and at no cost. the location is incredible, surrounded by water and fish and always with fresh red meats. The walls of the house are very well reinforced. the home is simple, of good food and good music. she is not full of riches, but he will live immensely happy. Hello Mr. Eventholder, I think you should choose my house because it's sorrounded by snow, where it's cold weather will make you think twice if you want to live like this or if you want to succed by getting a new job where it could give you more money and live in a better city like Yalahar or Edron, where luxuries are across the corner, so this one is for you if you are looking for new challenges and think about what are you doing wrong, you will have a lot of free time hunting fishes, deers, whatever gives you food because there's nothing else near, also sellers from Senja are almost always gone because there's no people living in the city. If you are interested, this one is for you. Sir Eventholder, i believe your troubles are over. I know how difficult this adjustment was for you. The good news is that i'm giving present for you, a very beautiful and comfortable house. She is in an excellent location, no criature is able to invade the house. In the interior of the house you will have a kitchen with barbecue grill and sea view, in addition to a beautiful dining room and a very elegant entrance hall. to meet in the evenings ... I hope you like it, with affection; Jin Toujo. Dear Eventholder, It's my pleasure introduce you to the Stronghold of Ice and Fire, a strategically built fortress containing the following rooms: 1. Throne room, which combines comfort and elegance, the ideal place for every player to appreciate their achievements and adventure spoils; 2. Central room, It's the heart of the fortress, the place that serves as a ballroom where friends can gather to feast by the fire or the meeting hall where soldiers can trace their tactics; 3. Fishing area, the ideal place to relax and at the same time keep up with the art of fishing; 4. Armory, the room responsible for keeping the "king's peace" both in and out of the stronghold. The fortress has the presence of two trained wolves, creatures responsible for guarding the entrance. Every fortified building has its secrets, my fortress is no different, tell no one but below the bonfire there is a passage that leads to an ancient frost troll lair, an ancient site that was already here before the fortress was built by my ancestors, and is now used as a escape route during emergencies. Hello Mr. Eventholder, I think you should choose my house because it was made for display. Everyone can enjoy their new home that was built in this fantastic theater. Dear Eventholder, I present to you the Explore's Retreat. Every explorer who devotes hours solving puzzles like The Paradox Tower, The Prisoner's Riddle, The Mad Mage Room or even challengers that require more brute force like the Deeper Fibula Dungeon deserves his own place, a fortress to rest and recover the energies. The Explore's Retreat is located near an old and calm Tibian City. The explorer can relax by taking care of the garden or feeding his faithful hounds. The fortress itself has fortified walls and two watchtowers capable of watching over both land and sea, the perfect choice which combines comfort and security, ideal for that dinner between friends. In addition to the main hall and the garden, the fortress also has a special room in which the explorer can sit back and enjoy the spoils of his adventures. The house includes: music corner, bedroom, kitchen, balcony and garden. is the perfect place to relax and practice your passions. It combines everything that I love in life: nature, flowers, music, food ... and sleeping. It isn't common house, it's dream house! I decided on another server because there are so many people on Antica to destroy it. Dear Eventholder, With all the stress that is happening because of your home, I believe I have prepared the best for you. This environment tries to reconnect you with nature, it is possible to find a beautiful winter garden, where you can see a beautiful specimen of a rare butterfly species that only finds here. In addition, there are other animals that are part of this scenery to make you feel relaxed and comfortable. And more!! We have a beautiful view of the sea that provides you with a wonderful breeze and a freshness in the environment on sunny days. It is a house that although simple has an excellent quality in its structure and with several attractions.